Trust: Through everyday behavior, “followership” requires that the leader provides evidence that they can be trusted. Stability: Leaders with strong “followership” remain calm in the face of panic and give a sense of confidence to those around them. Compassion: Strong “followership” leaders have unrelenting passion for people and show empathy when those folks are enduring hard times. Hope: “Followership” requires that the leader has unwavering belief that their product/service will not only succeed, but will change lives. Manning (2015) points out that the truth also sets the stage for a candid workplace culture. This allows it to be a productive and safe place for team members to be engaged and part of a learning organization culture. 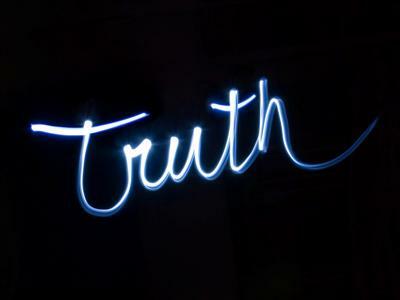 The truth never hurts us, it is what we do with the truth. I really like the way Manning (2015) describes the truth as giving us the ability to act fast. 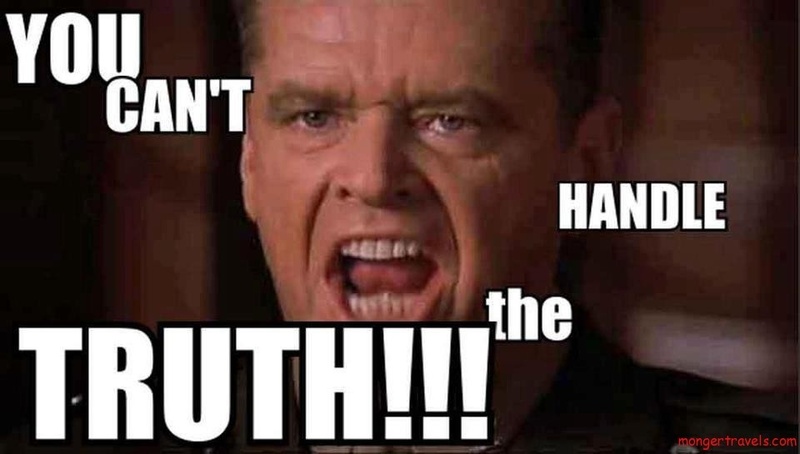 He posits that truthfulness is a change agent (Manning, 2015). This truthfulness will act as a catalyst for making decisions that mirror our core values, wisdom, self-discipline, and integrity. We must remember to make the truth a part of our core values. “Followership.” Followership. The University of Oregon, 01 Jan. 2013. Web. 15 June 2013. Peterson, Gary. 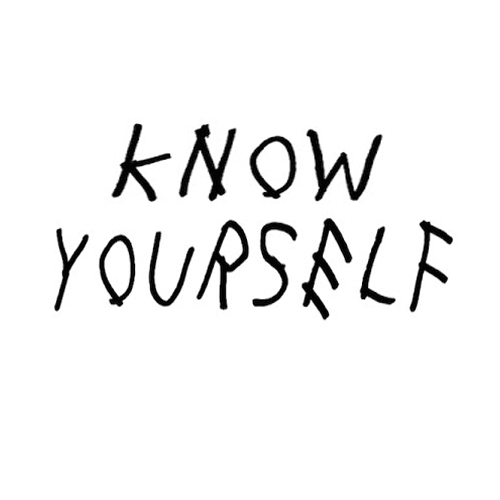 “Leadership 310: The Four Principles of ‘Followership'” Forbes. Forbes Magazine, 23 Apr. 2013. Web. 14 June 2013. It is amazing to me how two entries in two entirely different books could be so alike in the entries today. 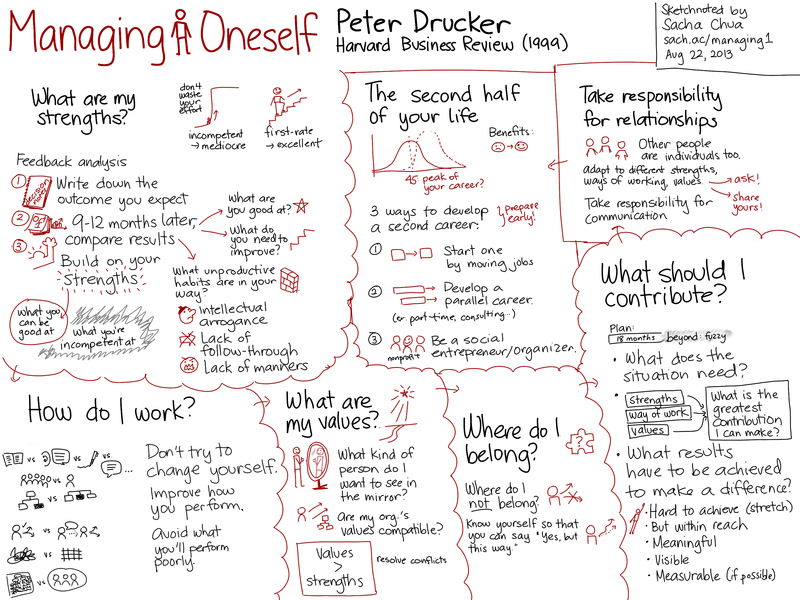 In A Year With Peter Drucker (Maciariell, 2014) discussed “A Catalyst to Help People Manage Themselves and Move to the Second Half of Their Lives.” I titled my blog post about that entry “Managing Oneself.” Click here to read that post. In that study I learned that once we understand our strengths, our values, how we work, and areas in which we are likely to make a contribution, we are ready to manage ourselves in the second half of our lives. 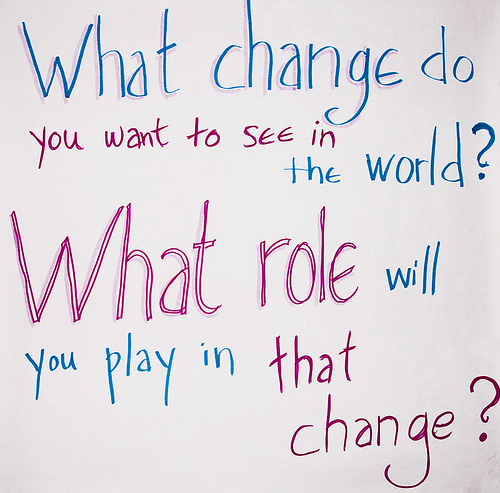 In today’s entry in The Disciplined Leader: Keeping Focus on What Really Matters (Manning, 2015), John Manning taught us that part of initiating a change or developing professionally begins with an analysis of ourselves. This analysis can then provide the necessary building blocks for continued improvement. What are we good at – that is, our strengths. Managing oneself requires that we understand our values. We should understand how we work best – alone or with others as a team. Are we good at taking on unstructured tasks, or do we do better when we understand the structure at the outset? I am going to try one of Manning’s (2015) Take Action! Tips and would encourage you to as well. Identify five changes in routines you could do tomorrow that are easy. I can think of five right of the bat that would make me a better leader. I’ll bet you can to! Once we understand our strengths, our values, how we work, and areas in which we are likely to make a contribution, we are ready to manage ourselves in the second half of our lives. In order to reach significance, Drucker believed you could not do more that two or three initiatives; with one probably being the best focus (Maciariello, 2014). Today, knowledge workers are likely to outlive organizations, and the knowledge worker has mobility. Mobility is widely accepted in the United States, but the idea of outliving organizations is still a tougher pill to swallow. Drucker believed that boredom leads to an underutilization of our talents (Maciariello, 2014). We run the risk of what he called being “mentally finished.” Therefore managing oneself requires us to prepare for the second half of our life. 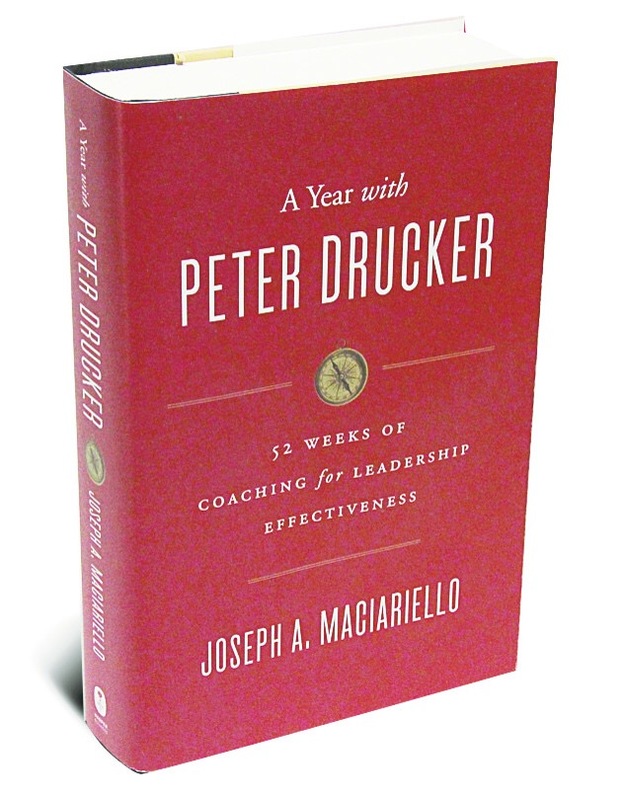 It is hard to believe there are only 10 lessons left in A Year With Peter Drucker (Maciariello, 2014) after this week’s entry. This means a couple of things: I am about to finish a book that has inspired a great deal of thought and action in me; and, we are only 10 weeks away from closing out 2015. This week’s lesson reminded me of the entrepreneurial spirit that brought about the social civil society we now have in the United States. The Salvation Army, CARE, Alcoholics Anonymous, Red Cross, Girl Scouts, and Lions club were all organized as the result of a service oriented entrepreneur recognizing a social need. In 2011 there were approximately 1.6 million tax-exempt, 501(c)(3) organizations in our great country. This 1.6 million was made up of private charities, private foundations, and religious institutions (Maciariello, 2014). Clearly social innovations is one of the distinguishing characteristics of American society. 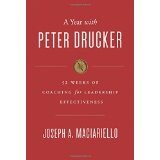 Drucker (Maciariello, 2014) advised us that an opportunity set exists for successful leaders in the second half of life to create significance. If leaders, according to Drucker (Maciariello, 2014), have a develop a narrow focus they can find opportunities for utilizing their gifts in their communities, states, nation, and the world. To do this we need to analyze our own strengths, weaknesses, and core values. Drucker (2014) also spoke of how systematic innovation can be found when he said, “The unexpected – the unexpected success, the unexpected failure, the unexpected outside event; the incongruity – between reality as it actually is and reality as it is assumed to be or as it ‘ought to be’; innovation based on process need; changes in industry structure or market structure that catch everyone unawares. The second set of sources for innovative opportunity involve changes outside the enterprise or industry: demographics (population changes); changes in perception, mood, and meaning; new knowledge, both scientific and nonscientific (p. 333).” When reflecting on the lessons of Peter Drucker I was reminded of how Duke University was founded. Back in the 1920s, James P. Duke wanted to build a medical school and a hospital to provide medical resources, including doctors, to the Carolinas. Today, Duke University provides a place for extraordinary academic learning and research. This is accomplished through undergraduate and graduate schools, research centers and a variety of international programs. In Mr. Duke’s vision, leadership also involved harnessing the power of higher learning for the larger social good to meet the world’s great needs. Duke University is now widely recognized for its pioneering leadership in social entrepreneurship education, having provided essential and important legitimacy for the field by producing and facilitating academic research that has defined, informed, and advanced the field, and having delivered high quality courses to undergraduates and graduate and professional students eager to learn about the field. This is a pretty outstanding example of successful social entrepreneurship if you ask me. We all need to take some time, especially as we reach halftime, to think about our “opportunity set” and what we need to learn to make a significant commitment, thus, ensuring a probability of success. This week’s entry in The Disciplined Leader (Manning, 2015) is a great one that we all have to diligently work on as leaders taking the responsibility of leading ourselves first in order to effectively lead others. The topic was that of managing our worries. This is one topic that we can all say we have experience with, right? If we are honest, this is something we all struggle with. Instead of mindlessly rushing through life, often stop during the day to ask yourself what really matters to become more aware of your inner world and the chatter in your mind (metacognition). Another very helpful way to calm anxiety and fear is to take the proverbial ‘fly on the wall’ perspective as an observer. When you experience these emotions, imagine stepping back as a third person observer and observing yourself and the situation at a distance. 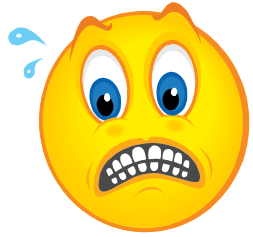 Distancing has proved to be one of the most effective ways to calm our fear. This mindfulness allows us to be very thoughtful in analyzing the situation to either develop a solution or realize no action or worry is necessary because it is out of our control. 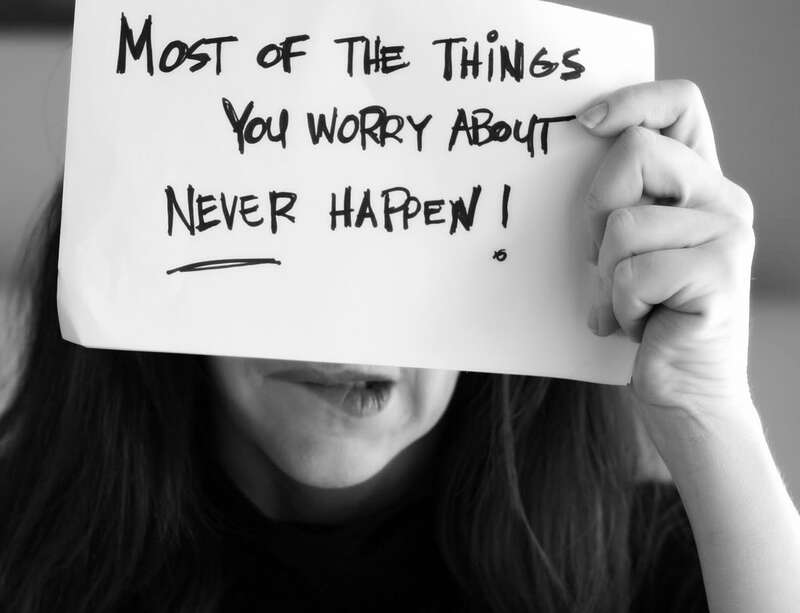 Understand that worrying is not a solution. 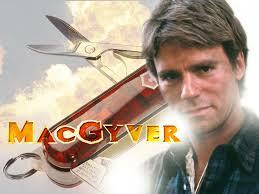 I am reminded of one of my favorite TV shows growing up: MacGyver. I’ll let you click on the link I’ve provided to get the details if your not familiar with the show. My takeaway and lesson I learned from watching the show was that MacGyver never let fear take over; he looked for the solution instead of staring at the problem. Then he would take action with his trusty Swiss Army knife and go to work. What a great lesson – if you have never watched an episode get one and let the learning begin. Surface your worries. Categorize into what you can control and what you cannot control. I always go one step further and think about what do I need to control and when do I need to worry about controlling it. In other words is it something that is a priority right now. Reduce worries. This involves being proactive. Taking control where you can. I use the example here of having a very tight and sound school safety plan. I can’t control what may happen, but with an outstanding plan that every staff member understands, I can eliminate constant worry. Finally, just be mindful of priorities and use your problem solving skills to diminish your worries so you can be like MacGyver and look for solutions instead of mindlessly staring at the fear. In this week’s entry in A Year With Peter Drucker (Maciariello, 2014) continues with the theme of going from success to significance. Drucker posited that the knowledge society we now live in creates such an opportunity (Maciariello, 2014). We need to remember, however, that sometime we are not able to fulfill our greatest desires for significance even if we are successful in our present position, job, or career. Remember, success does not necessarily equal significance. In fact, most times it does not. Many times we are so busy working on success, as measured by salary, title, employer, and awards, that we lose the vision of what would make us truly happy. Parallel Career: Taking a position in a church or some other social sector organization using your top skills and talents for the betterment of others. 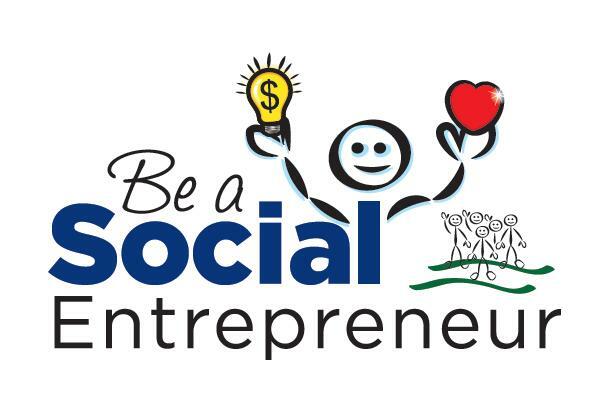 Social Entrepreneurs: Using significant financial resources or contacts to make a difference by solving social issues. Often it is our duty to do what we are good at even though we would rather do something else. There may come a time when we are mostly free of our obligations and can do what we truly love. I would have to point to my father in-law, Fritz Behrens, as an example of someone who has found significance. In fact we just had a conversation last night about his next steps – I must point out he is in his mid-eighties! He has been on boards that have done significant great things in Anderson, Indiana. He also served the City of Anderson after selling his successful family business. Additionally, he has been of tremendous service to his church. He led the building of a new church, and in my opinion a great church business model would be for him to serve as Chief Financial Officer (CFO) of the church. With his great business sense, unwavering faith, and ability to build relationships he could run (financial and operations) a church of considerable size on a couple of days a week. Plus, he is a a point where he could do it for nothing in terms of salary. Think about that – that’s significance. It is really hard to find a senior minister who is good in all the areas of pastoring a church: oratory skills, outreach, ministering to youth, financial management, and operations management. So, why not go find the greatest pastor with the skills, that in my opinion, matter most: oratory skills and ministering. Then, let a second halfer like my father in-law manage the church with his tremendous skills. I am still amazed that more churches don’t do this. I am such a believer in what Drucker says here. Those that know me well know I have many such outside interests. One of the most important to me is the operation of our farm. In the last several years we have added a dairy operation because of my son’s 4H dairy project. I love it because it has enabled me to teach my son, Heath, many animal science skills I have learned over the years and as a part of my Animal Science degree from Purdue University. An example of this learning would be studying the genetics to make breeding decisions for his cows. 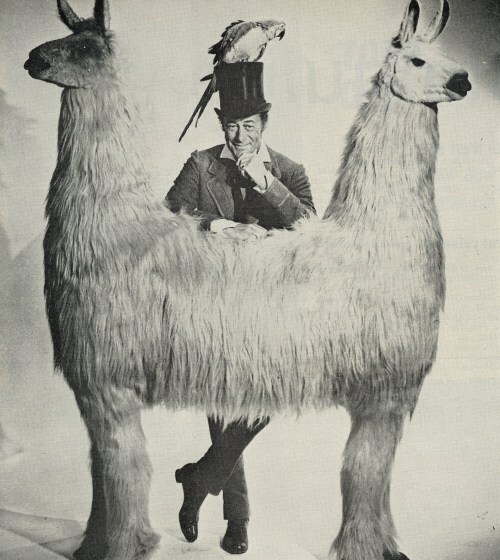 Also, most recently the studying of available females to move his herd to a higher level. Through our diligent studying we were able to purchase a champion female bred to have a calf next spring at the World Dairy Expo in Madison, Wisconsin two weeks ago. Through this outside interest and teaching my son, I am able to develop my strategic planning skills that ultimately has an effect on my leadership roles in education. Not to mention some high quality “dad and lad” time with my son! Engage in career planning by clearly identifying your strengths and values. Continue to develop your strengths. Early in life, plan for a second career. Consider volunteer work that may itself provide the transition to a second career or provide enough fulfillment to achieve significance. What will it take in your career to allow you to seriously explore opportunities to move from success to significance, assuming you cannot do so from where you are right now? The Sheer Guts of Leadership! 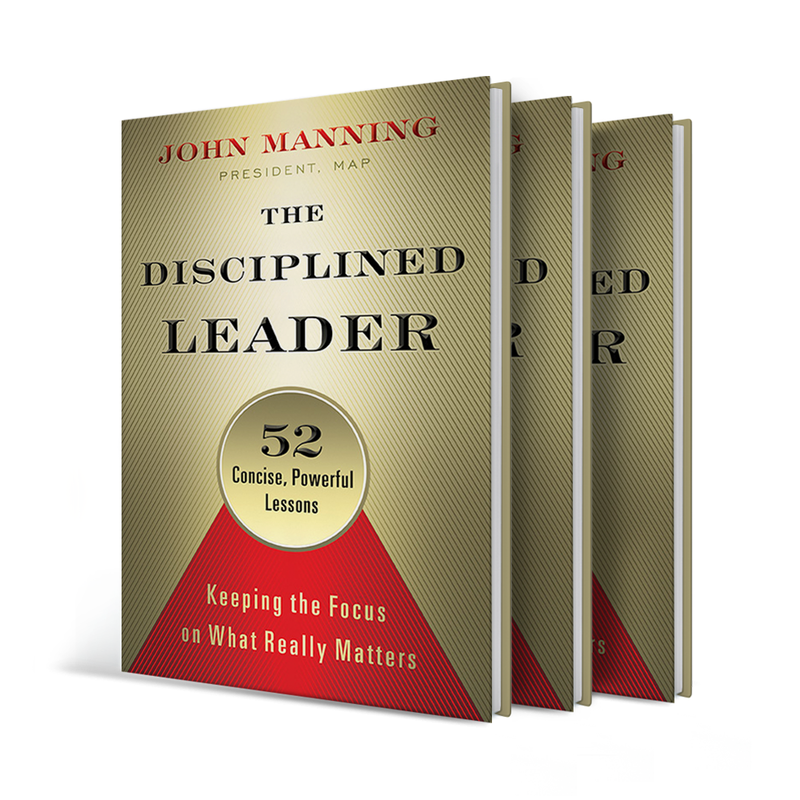 It’s hard to believe it is already time for Lesson #2 in our learning with John Manning in The Disciplined Leader. Without courage it is impossible to focus on what really matters (Manning, 2015). In my case of having now taken on the exciting and important work of leadership of two failing schools, I can tell you courage (or just sheer guts) is a necessary prerequisite skill. Courage is necessary just to get me through those days when I say, “What the heck am I doing here!” You ever had one of those days? 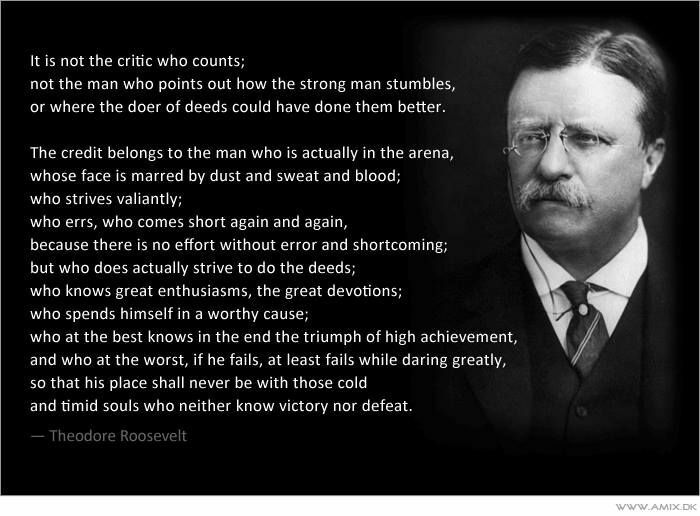 If you haven’t I honesty feel sorry for you because you truly have not been in what Theodore Roosevelt called the “arena.” His entire thought is in the picture above. Doing significant work that matters puts us in that “arena” and makes us vulnerable and the focus of our critics. I love how Manning (2015) puts it: “…great leadership isn’t about facing fears but taking positive action in spite of your fears” (p. 17). Look the Fear in It’s Face. In other words, recognizing your fear and then determining what you need to discipline in order to act against the fear. In my case I know I need to study to obtain current information, pertinent data, facts, figures prior to a media interview, panel discussion, presentation, or speech to overcome any fear of not knowing an answer to a question. Create a Plan of Attack. In my case I have trusted professionals I can go to, as advisers, to help me analyze what information I might need and help me to obtain the information I need for the example I used above. Then I study! But, as Manning (2015) points out: “to admit you do not always have the answer is more a show of strength than weakness” (p. 19). Acknowledge When You Succeed. I learned a long time ago that we need to learn to be nice to ourselves. In other words we need to show compassion for ourselves when we are not perfect, make mistakes, or when things go well, too. Scrutinize and self-reflect on what went well and how we made that happen and how to repeat the process. Do They Really Want To Know What They Need? I made a statement the other day that I didn’t necessarily make intending to be profound, but just how I felt at the time about something going on in my world. The statement was: “I really don’t think they really want to know what they need.” It was an authentic belief that that I had in the context I was in at the time, needed to be said. Turns out, it was heard loud and clear by those I was talking with. Peter Drucker said, “You need to use your energy where you can get results.” If you lead and organization you must know what you need, but are there times you don’t want to know what you need? The thought of an organization, board, or leader not wanting to know what they need seems paradoxical, but is it? How many times are decisions made based on a knee jerk reaction or the self interest of someone. This really is a much bigger issue, as I found out from the discussion that ensued from the quick point of criticism I had made. As John Kotter has told us; substance is more important than leadership style. This substance, in my view, includes making sure all those in the organization know what they need. This is so very important for those who are members of boards. 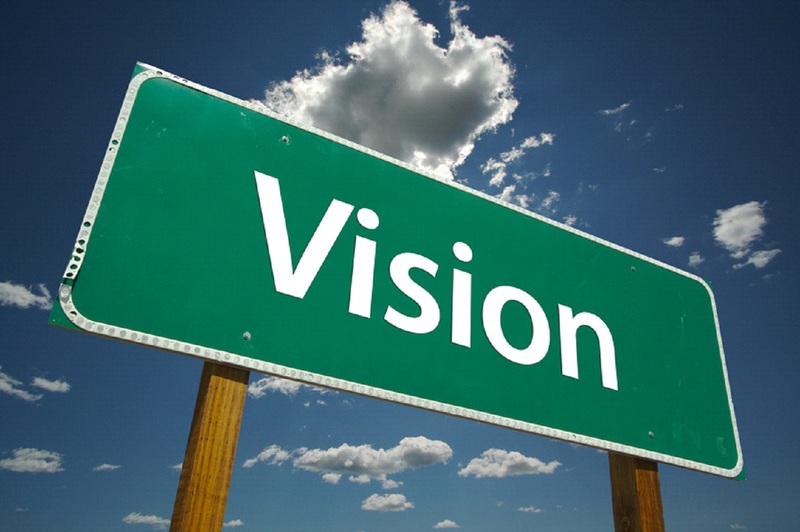 A board member who just wants to make decisions based on personal wants or self serving desires will lose sight of what is needed for the great good of the organization. In other words, not caring or really wanting to know what is needed. This can happen very easily to school board members who have children enrolled in the school they are a board member of. It is very hard to what I call “leave the parent hat at the door,” and make decisions based on what is best for all students served by the school. Sometimes hubris can cause us to not want to really know what we need. We, as leaders, get so locked into what we “know” is the right way to do something and we do not take the time to find out what we really need, or need to know. This is dangerous. I am reminded here of the story of Icarus and the power of hubris. Icarus and his father attempted to escape from Crete by flying. Icarus’s father constructed the wings from feathers and wax. Icarus is then warned by his father about the power of complacency and the danger of hubris. Icarus was instructed not to fly too low nor too high. The sea’s dampness would clog his wings and the sun’s heat would melt them. Icarus ignored his father’s instructions not to fly too close to the sun, whereupon the wax in his wings melted and he fell into the sea. It really is about not being in touch with the core values of the organization we serve. If we don’t want to know what we need we float through periods of time without direction or purpose. Challenges are difficult to solve and opportunities are hard to seize if we are not aware of what our organization’s real, underlying needs are. Great leaders need to ask the tough questions and want to know what they and the organization needs. There are those who say that the consequences of poor leadership are minimal because so many factors affect the performance of an organization. I would argue, however, that most of those factors can be influenced by leadership, both good and bad. Not knowing what an organization really needs can cause the leader to point in the wrong direction, give no direction, or not move fast enough. According to John Kotter, without sufficient leadership, the probability of mistakes increases greatly and the probability of mistakes increases greatly and the probability of success decreases accordingly. Last week in A Year With Peter Drucker (Maciariello, 2014) we began to examine “halftime.” What Bob Buford described as the time when we move from desiring success to wanting to achieve significance. Activities for significance are by and large an enormous opportunity, but many people don’t have the imagination to identify possibilities. 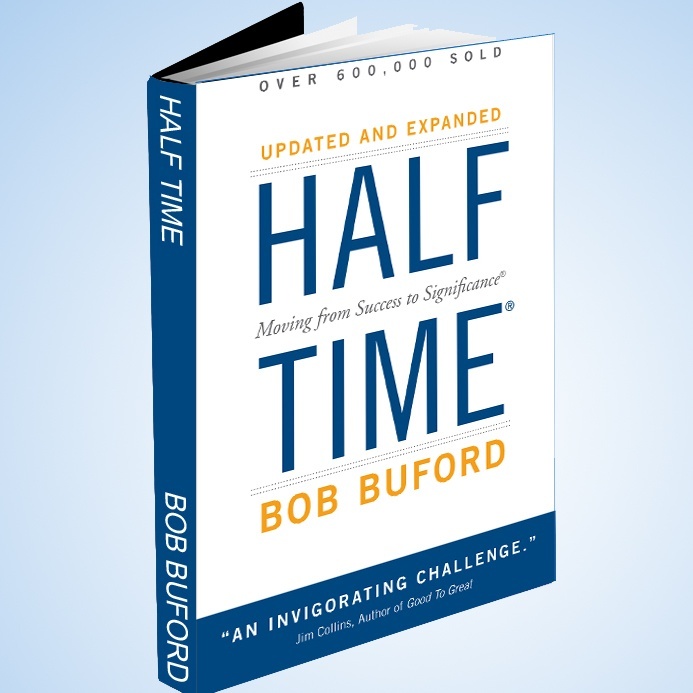 I became so interested in “halftime” that I went ahead and read Bob Buford’s book Halftime this week. Buford focuses on this important time of transition—the time when, as he says, a person moves beyond the first half of the game of life. It’s halftime, a time of revitalization and for catching a new vision for living the second half, the half where life can be lived at its most rewarding. Bob Buford provides the encouragement and insight to propel your life on a new course away from mere success to true significance—and the best years of your life. I highly recommend the book Halftime. 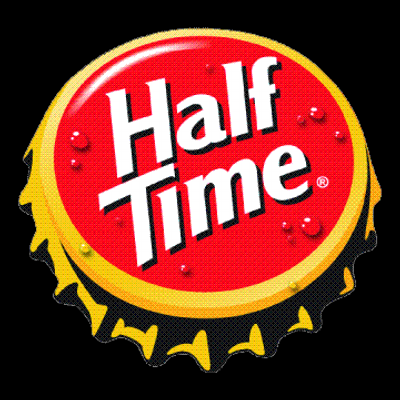 This week’s entry in A Year With Peter Drucker continues on the idea of halftime and gives the reader a peek into the process of how to achieve significance while going through halftime. Those who follow their interests in social sector activities early in life by volunteering their services may confirm their instinct to serve in specific capacities. This is turn may provide the imagination and inspiration needed either to begin a second career or to become a social entrepreneur (Maciariello, 2014). 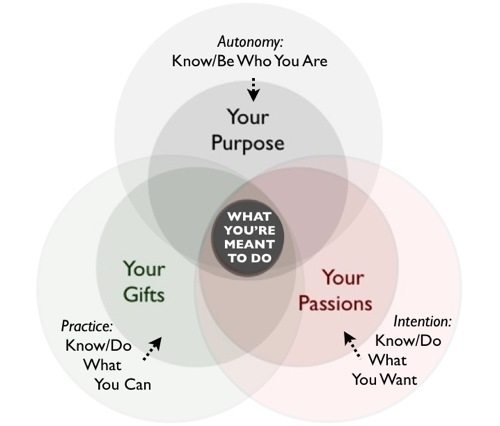 In order to find our way to creating significance we must discover our specific giftedness. 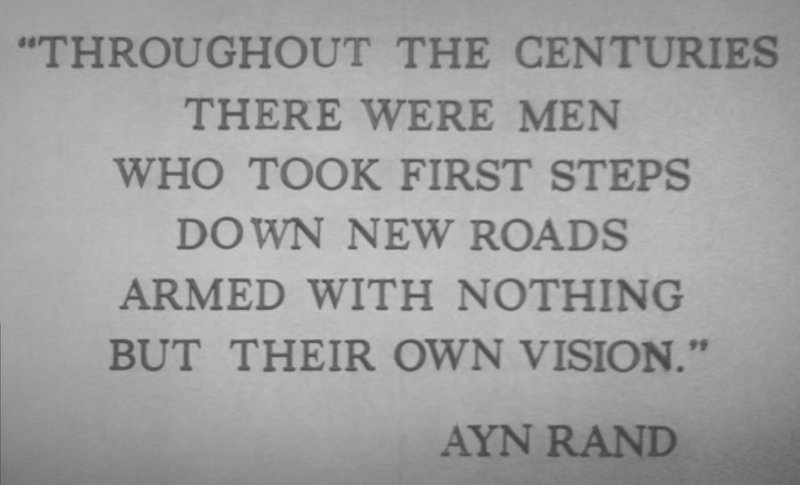 In other words we need to work doing what we do best. Individuals and organizations may need help in thinking through just what they are trying to accomplish with the talent available; and in obtaining the necessary contacts and making the necessary preparations to do it. An individual must fit the organization and the organization must fit the individual (Maciariello, 2014). There is one requirement, as I see it, for managing the second half of one’s life: to begin creating it long before one enters it. Peter Drucker argued, “If one does not begin to volunteer before one is forty or so, one will not volunteer when past sixty. Similarly, all the social entrepreneurs I know began to work in their chosen second enterprise long before they reached their peak in their original business.” (Maciariello, 2014, p. 321) With the age expectancies rising into the seventies, we need to be thinking about halftime in our mid thirties to forty. If you want to make a contribution in the second half of your life you must understand how to manage yourself to make the right contributions. So, “What is in your box?” In other words you must decide what is most important for you to create significance. What are your strengths and values? Where are you finding an outlet for them? Is your job a sufficient outlet for your talents and values? This past week a discussion came up about how do we get young leaders to grow. Leadership growth happens when there is stretch. 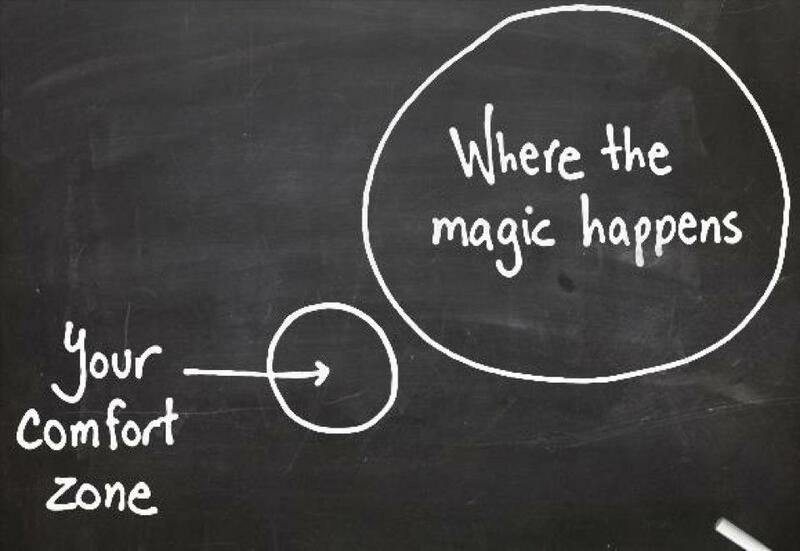 By stretch I mean being put in an uncomfortable place – In other words, pushed. But, is pushing always the best approach? At the time of this story I was an agriculture science teacher and FFA advisor. Needless to say, I was very competitive in FFA contests and really pushed students hard to success. We had many state champions and many students that went on to successful careers based on the foundations that began in those contests, or Career Development Events as they are called now. But, that’s not what the focus is here. Wow, I was devastated! How stupid I had been. I was so glad Suzie had given me this slap in the face, however, because it changed me and gave me a new perspective as a leader. From that time on I would always remember how important it is to pull those I serve up alongside myself and work shoulder to shoulder while at the same time pushing occasionally, too. Suzie had taught me how to lead in such a way that followers would choose to act. Pulling a person in motivation means creating conditions that they choose themselves. It means showing them how something else will be beneficial to them. It means them deciding rather than just you deciding. Push and pull are a matched pair: pushing is the stick to the carrot of pulling. It is discovery as opposed to the ordering of push methods. It is creating desire rather than creating fear. It is creating attraction rather than repulsion. While the objectives of PUSH and PULL are the same, the way that one goes about achieving these objectives is very different. The objective is the same, but the approach is very different. To help pull it is important to help those we lead to set goals with a reasonable chance of achievement, but not so easy as to lack challenge. We must also have people develop their own specific plans for how they will accomplish their goals; then jointly review these plans and provide our input. Regularly ask people how they’re progressing in reaching their goals and ask what you can do to help them achieve or exceed their goals. I believe it is important to express confidence in the individual’s ability to reach goals. We must follow up regularly on progress and reinforce all movement in the right direction. Demonstrate enthusiasm to our teams by talking about why the organization’s goals are important and encouraging others to set challenging individual goals. 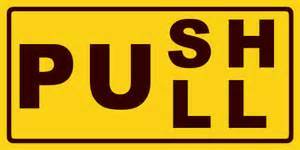 So how do we move from the push style of leadership to a pull leadership style. Essentially it requires becoming involved with the challenges and initiatives your organization has before it. We become involved when we show both in what we say and what we do that we are interested and care. We need to clearly demonstrate that what we do is for the greater good of the organization, not merely something that will boost our own value. We need to clearly demonstrate with words and actions that we want our team to develop as individuals. It really is about remember that the most important thing we can focus on as leaders is our people.